Do not over-rev the engine when shifting to a lower gear. This may cause a loss of control or engine damage. Do not rest your foot on the clutch pedal while driving. This may cause clutch damage. Fully depress the clutch pedal before shifting to help prevent transmission damage. Stop your vehicle completely before shifting into R (Reverse). When the vehicle is stopped with the engine running (for example, at a stop light), shift to N (Neutral) and release the clutch pedal with the foot brake applied. Do not shift to the N (Neutral) position while driving. Doing so may result in an accident due to loss of engine braking. To change gears, or when upshifting or downshifting, depress the clutch pedal fully, shift into the appropriate gear, then release the clutch slowly and smoothly. To ensure smooth gear changes, fully depress the clutch pedal before operating the shift lever. If the clutch pedal is not fully depressed before the transmission is shifted, a gear noise may be heard. Transmission damage could occur. Start the vehicle in the 1 (1st) position and shift to the 2 (2nd), 3 (3rd), 4 (4th) and 5 (5th) gear in sequence according to the vehicle speed. 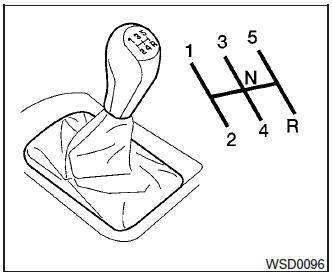 You cannot shift directly from 5th gear into R (Reverse). First shift into N (Neutral), then into R (Reverse). If it is difficult to move the shift lever into R (Reverse) or 1 (1st), shift into N (Neutral), then release the clutch pedal. Depress the clutch pedal again and shift into R (Reverse) or 1 (1st). The following are suggested vehicle speeds for shifting into a higher gear. These suggestions relate to fuel economy and vehicle performance. Actual upshift speeds will vary according to road conditions, the weather and individual driving habits. Downshift to a lower gear if the engine is not running smoothly, or if you need to accelerate. Do not exceed the maximum suggested speed (shown below) in any gear. For level road driving, use the highest gear suggested for that speed. Always observe posted speed limits, and drive according to the road conditions, which will ensure safe operation. Do not over-rev the engine when shifting to a lower gear as it may cause engine damage or loss of vehicle control.